I was able to sneak around the backside of the Greet Castle food cart pod today on a walk and bypass my sweet sweet lover Cackalack’s Hot Chicken Shack. I walked a path to Bailey’s Gourmet Hot Dogs. 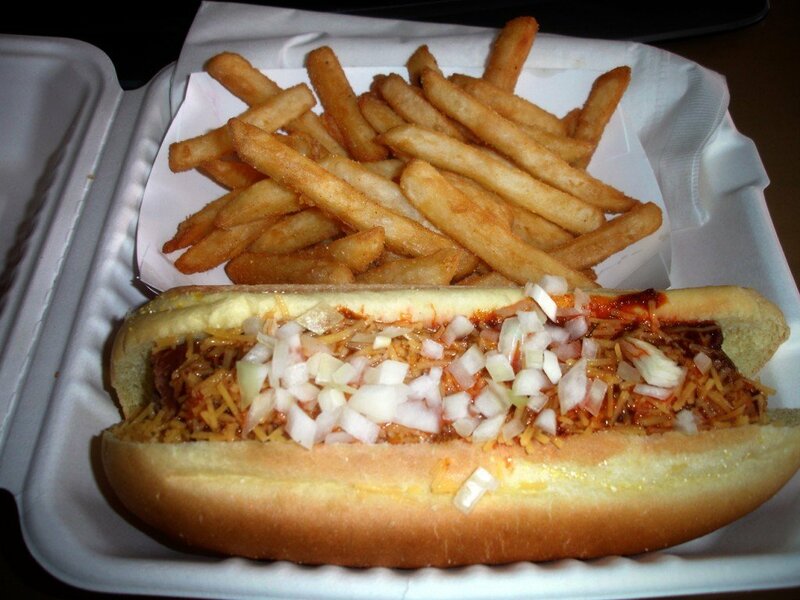 Maybe it is because I am from Michigan where the signature ‘dog is a Coney Island (topped with an all-meat chili, possibly diced yellow onion and yellow mustard), but the chili dog I ordered yielded a consistent emotional response in the vein of ‘meh’. I got the combo meal which included a drink and some really tasty garlic fries. I have to say, Little Big Burger might have a solid contender if they were to add some truffle oil to these suckers. That said, they don’t have truffle oil and are merely really well timed in the fryer. Crispy fries with some garlic salt and a ‘secret ingredient’…most likely paprika from what I can tell. I’d give the fries 7/10 finger-lickins while the rest of the meal was at a mere 4/10 finger-lickin’s. It isn’t the end of the world for Bailey’s though. I think if they spend a little more time on the bun (which was a little dry–not in the yummy grilled way) and a little time on beef selection, they might have something that could get 1 or 2 more finger-lickins. Tonight I’m stoked to take the lady out to Bamboo sushi for some killer nigiri. Ha! I was going to grab a Chili Cheese Dog this morning before work. Now I’m gonna have to readjust my position. I too, was hoping the chili was coney island esque. When I asked him about it when he first opened all he would say is that it doesnt have beans. That wasnt much to go on, glad to find your write up. BTW; have you tried Diamond Thai yet? Its good. The Thai place is next stop on my review circle! I’ll be sure to post my findings! I tried him anyway, and you were right, it wasnt very good. My Urbanspoon review was pretty harsh, but honest. Oh well. I didnt see your review linked there though…. Truth. Jeff told me you gave him some harshness. I’ll be linking both sites sites shortly.